Journalists were among those aboard of the military Tu-154 bound to Latakia, Syria. A military Tu-154 aircraft heading for Syria crashed into the Black Sea. All those onboard were killed in the tragedy. Investigators are considering three theories: human error, a technical malfunction or a terrorist attack. A Russian Defense Ministry Tu-154 aircraft en route to Syria crashed into the Black Sea early on Dec. 25 some one mile off the coast near Sochi. Reports on the number and identity of passengers vary. So far it has been confirmed that the people onboard included 68 members of the famous Alexandrov Ensemble, 9 journalists and 8 crew members. Emergencies Ministry search and rescue teams have already recovered at least 10 bodies. Russian President Vladimir Putin has instructed Prime Minister Dmitry Medvedev to set up a state commission and to take the investigation under his personal control. According to Russian media reports, the incident occurred as the aircraft was picking up altitude. However, the crew did not send out any distress signals. Emergencies Ministry and Investigations Committee experts are now working at the scene. They have obtained documents related to the flight and are now questioning relevant officials and airport technical staff. They are looking at three possible theories of what may have caused the crash. According to head of the Aeroflot Civil Aviation Association Viktor Gorbachev, the aircraft may have experienced a power shortage during the flight. "There must have been something wrong with the engines. We don't know yet and it is hard to speculate: was it fuel or engine failure…Takeoff is, of course, the most difficult moment. The aircraft just did not have enough power or speed and went into a tailspin," the expert said. The Tu-154 was manufactured in 1984. It last underwent repairs in 2014 and had scheduled maintenance in September this year. However, according to Gorbachev, the aircraft's old age is not a problem. "There are aircraft operating all over the world that are 30, 50, even 60 years and older. In this case, it does not matter. The aircraft was airworthy, it met all the requirements," the expert added. Yet, not all analysts share this opinion. A TASS military expert, retired colonel Viktor Litovkin, points out that the fleet of civilian aircraft at the disposal of the Russian Defense Ministry, unlike its combat aircraft, is not in the best condition. "The bulk of the Russian Defense Ministry's civilian aircraft are Soviet-made Tu-154s. Because the aircraft manufacturing industry was nearly destroyed in the 1990s, no new military transport and passenger aircraft were manufactured for years," the expert said. The Russian Defense Ministry does not want to purchase foreign-made civilian aircraft, he continued, but it has nothing to replace the Tu-154 with. "After all the checks prompted by this investigation are over, the military will continue using these aircraft," Litovkin said. The captain of the Tu-154 was pilot 1st rank Roman Volkov, with over 3,000 flight hours under his belt, the Russian Defense Ministry said. "The crew was one of the most experienced ones. They have several times, on the very same aircraft, led the transportation of Su-30s, Su-35s and Su-24s to the Hmeimim airbase," a source in the security and law enforcement agencies told Izvestia newspaper. Yet, analysts say, the investigation will consider the theory of human error. "No theory is ruled out, starting from poor-quality fuel to a terrorist attack. Even an error by the pilot, as a result of which the aircraft picked up altitude too quickly, made a tight turn and went into a tailspin," Litovkin said. 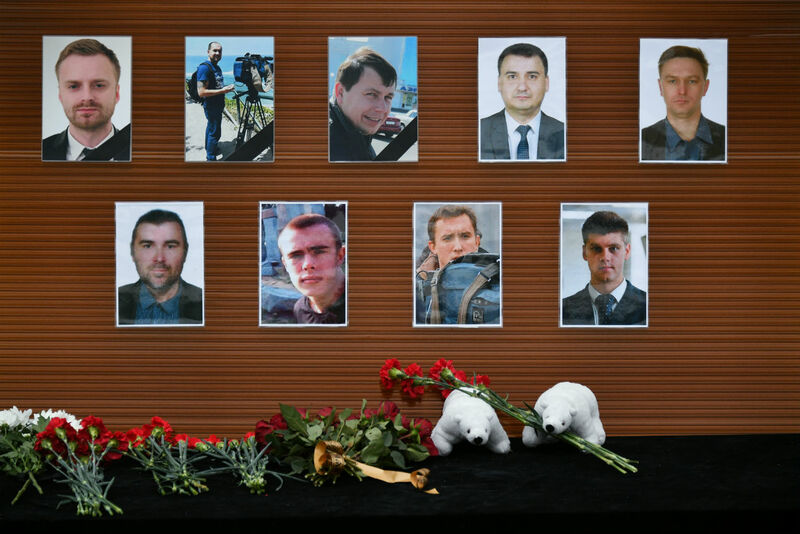 Some experts draw parallels between the Tu-154 crash and the explosion onboard a passenger Airbus 321-231 en route from Sharm-el-Sheikh to St. Petersburg that took place on Oct. 30, 2015. Terrorists had planted a bomb in the tail section of the aircraft where bulky luggage items were stored. Some 20 minutes after takeoff, the aircraft exploded, plunging to the ground from an altitude of several thousand feet. This time the tragedy occurred seven minutes into the flight. "The weather conditions were favorable. If there had been any problems with the aircraft, with the engines, it would have simply turned around and begun gliding towards the airfield, or would have landed offshore. Whereas here the aircraft just dropped down, as is the case when there is an emergency onboard, when something blows up or something falls off. As a rule, with these aircraft it is only the tail that could drop off," flight instructor Major Andrei Krasnoperov told Kommersant FM radio station. In all the other situations, he continued, the pilot could have informed the traffic controller of the malfunction and sent a distress signal. However, that did not happen. "Which means that something sudden and expected occurred seven minutes into the flight. So, I cannot blame the crew, and when there is a technical problem, it is seldom so sudden. [...] They have even found a man near the coast who was injured by the falling debris. Which indicates that fragments of the aircraft were scattered as they were coming down, suggesting that the aircraft exploded in the air," the pilot added.